++ Just a heads up! Products marked with a * are affiliate links, which means I'll earn a small commission if you purchase through them. In the middle of the whole instagram-super-heavy-makeup trend, I've been trying to go with an even more natural look for my face. Heavy makeup has never really been my thing, but I was still determined to try and make my face as matte as possible. Now, I've been focusing more on skincare in general (healthy skin means less makeup) and moving toward a luminous and dewy look. I'm also a fan of taking less than 10-15 minutes to apply everything. (Mainly because I can only leave my puppy unattended for that long or else she starts to eat things). Moisturize with *KORRES Pomegranate Balancing Cream-Gel Moisturizer. I want to keep my skin moisturized and healthy underneath my makeup, so I always apply moisturizer right after washing my face. I wait until it's fully absorbed before I put anything else on. Prime with *Hourglass Veil Mineral Primer. This primer feels amazing on my skin. I goes on super smooth and gives your skin a glow. It also makes your makeup water resistant. 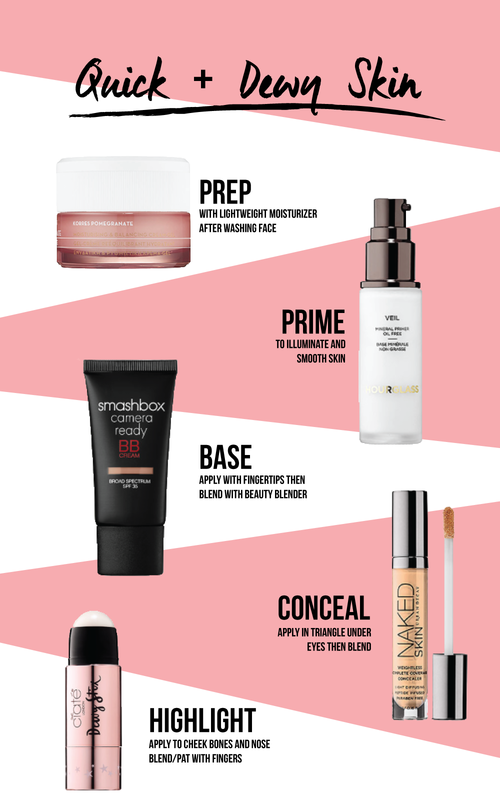 Apply *Smashbox Camera Ready BB Cream with fingers and then blend with a beauty blender. I just recently switched back to a BB cream after finally accepting that I didn't want the full coverage look and heavy feel of a foundation. I really like this one because it has SPF and it doesn't make my skin feel oily. I like to apply BB cream with my fingers because I feel like a brush soaks up too much product, but I then blend with a beauty blender to make sure everything is even and natural looking. Conceal/highlight with *Urban Decay Naked Skin Concealer. I apply a very small amount of this in a triangle underneath my eyes and then blend out with a beauty blender. It's honestly not my favorite because it's a little drying and tends to crease, but I haven't found anything that I like better. Apply *Ciaté Dewy Stix to cheekbones, nose, and cupid's bow; blend/pat with fingertips. I just picked this up at Sephora after getting a dewy highlight mini-makeover done and I'm obsessed with it. It's a highlighting balm that is low shimmer and creates a dewy, wet-look. And it stays on all day, which is always my end goal. Once my face is done, I'll fill in my brows and apply mascara. If I'm feeling the need for bronzer, I'll apply some powder under my cheekbones. I'll use a cream bronzer if I want a more defined look or if I feel like my face looks extra puffy. Finish with *Urban Decay All Nighter Setting Spray. This really helps keep my makeup in place and from creasing. I really really love the dewy skin look for the warmer weather. It looks natural, doesn't feel to heavy, and it doesn't look messy if your face gets a little extra dewy from the heat. 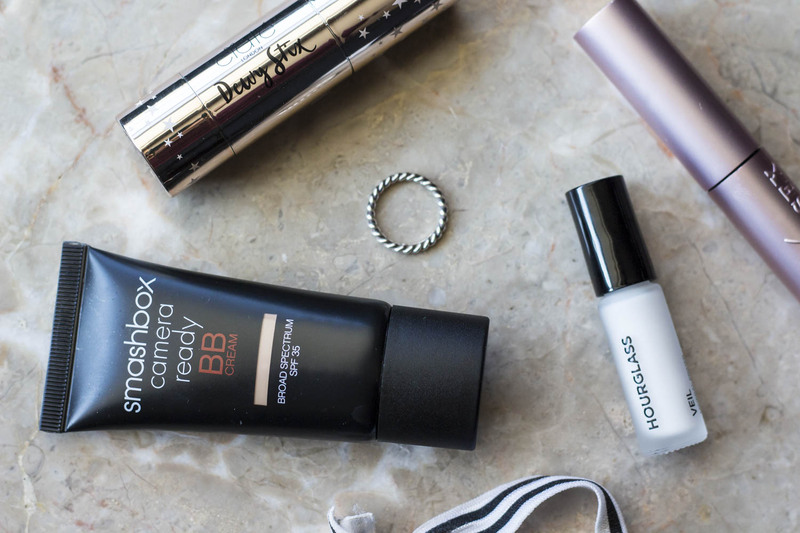 These products specifically are also great for warmer weather (aka being outside more) because they're super light weight and both the BB cream and primer have SPF. ++You can shop the products I talked about below!